Many of us search for Creative Common(CC) images to use them in many ways. I often search for them for my blog posts, web designs and application development. But searching for such images was never an easy task. To make our lives easy in finding CC images, Yahoo Image Search Engine recently added a new option to it’s search filters. With these filters now we can easily locate the CC Images that are for licensed for free commercial use as well as to remix, tweak and build upon. If you don’t see the Creative Commons filters on the home page of Yahoo Image Search Engine, don’t worry as they are not available there. 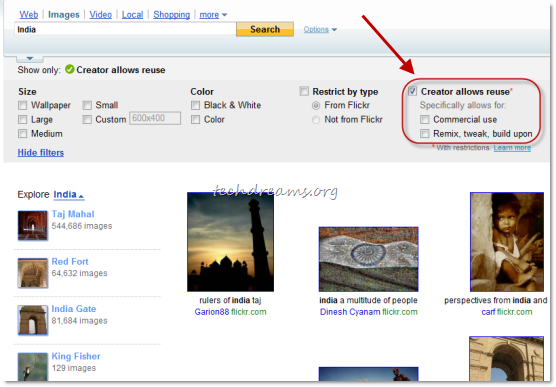 This filters are available only in the image search results page under the options “More Filters”. As of now Yahoo is capable of identifying the CC images available only on Flickr and soon it is expected to add more image sources to it’s CC images search repository. The Yahoo’s search bar follows us when we open the image from search results and displays relevant images and other search options on the top. Incase if we don’t like the opened image we can easily look for other images by using the search bar. Even though this is a small addition to the search capabilities of Yahoo Image Search, it is very much useful for people like us. What do you say? How do you search for CC images? Nice find Gopinath. This would save considerable amount of time.